Mackie, a professional music and recording equipment manufacturer, makes a full range of mixers, from the four-channel 402-VLZ3 to the 3204-VLZ3, a 32-channel mixer with effects and USB capabilities. 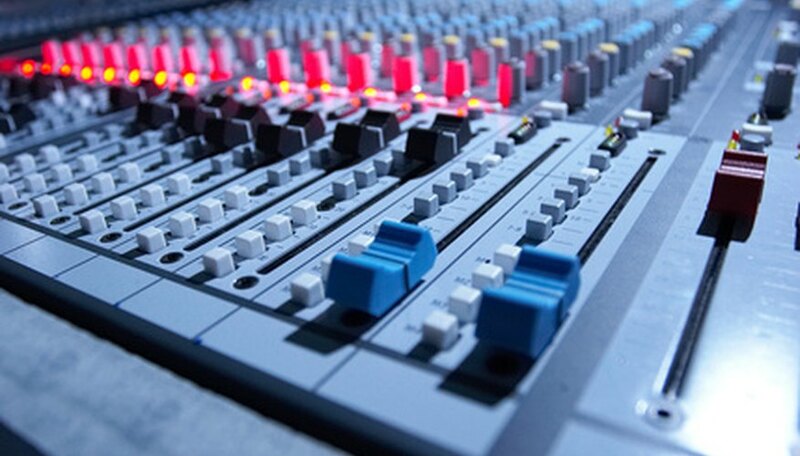 If you're having problems with your Mackie mixer, the best thing to do is to isolate the problem, run through the basic, easy-to-remedy possibilities and implement commonsense solutions. Once you confirm that the problem really is with the mixer--and not your cables, signal source, phantom power or other overlooked component--contact Mackie or take your mixer to a certified repairperson. Make sure the power's on. If you're having trouble with your Mackie mixer, start with the obvious stuff. Check that the mixer's definitely plugged in. Make sure you didn't hit the phantom power switch, which is usually right next to the power switch, on the upper-right top of the mixer. Double-check that the power cable is definitely plugged in to the back of the mixer and that the AC outlet itself is working. Make sure the channel is the problem and not the signal source. Confirm that the "Fader" or "Gain" knob is turned up. If you've plugged in a condenser mike and you're not hearing anything, perhaps the mike needs phantom power. If you've plugged a CD player or similar source into the board and you're not hearing anything, turn up the unit's volume; if you still don't hear anything, plug headphones into the unit and make sure it's working. Try a new fuse. Every Mackie mixer--up until the Onyx series--has a fuse inside the chassis-mounted power connector. To check it, Mackie advises first removing the power cable and sliding out the fuse-holder compartment. It should come straight out, perpendicular to the panel; gentle prying with a tiny screwdriver will release it. Once it's out, note the fuse's size and rating and replace it with a new one. Kill little noises like crackling and distortion by using newer cables and trying contact cleaner on a dusty, dirty jack. Try DeOxIT (see Resources). Get rid of bigger noises by turning the channel "Gain" and "Aux Return" knobs down, one by one; if the noise is gone, the source of your problem is either the channel you're using or whatever is plugged into it. Head straight to a channel's level knob (like its main ouput) if you're not getting the output you think you should be getting. Make sure it's not a problem with your cables. For a problem with a main "Out," for example, unplug that channel's RCA and XLR outputs. If the problem is gone, it was caused by was a short in one of the cables. Read your Mackie mixer's manual to make sure you haven't overlooked anything. If you don't have a hard copy, you can find most manuals online at Mackie.com. Check online forums to see if someone else has had the same problem and fixed it. If all else fails, contact Mackie tech support. Everett Bradman has been an editor since 1994 and a professional writer since 2000. He has worked for "The Miami Herald," the "San Francisco Bay Guardian," "Rolling Stone," "Vibe," "Bass Player," "Computer Shopper" and NYC & Company. He holds a Bachelor of Science in journalism from Florida A&M University. Why Is My Guitar Amp Buzzing?